Here’s a quick overview, courtesy of the Friends of the Bird Sanctuary. To learn more about the Bird Sanctuary, you can visit their website. First, you should know The Bird Sanctuary isn’t just for birders and wildlife watchers. It’s also a great place for picnicking, berry-picking, hiking, backcountry skiing, and snowshoeing. On their website, the Friends of the Bird Sanctuary also mention that this is a great place for “wildflower observations.” That’s a nice way of saying you can look and take all the photos you want, but please don’t pick them. Some of these wildflowers, even if locally abundant, are apparently quite rare. 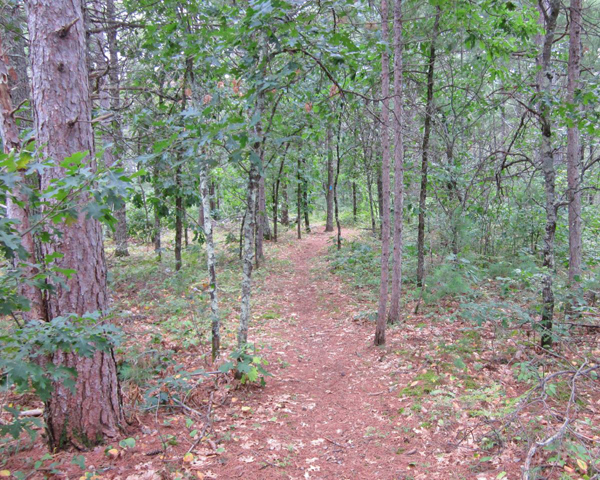 The North Country Hiking Trail runs through The Bird Sanctuary, and you can also hike on lots of other trails. Horseback riding is allowed on designated trails. Although none of the hiking trails within The Bird Sanctuary are designated for biking, its the paved and dirt roads are great for biking. (Some of the sand roads, however, are quite soft.) Nearby, you’ll also find lots more roads and trails. As part of their educational outreach, The Friends of the Bird Sanctuary sponsor an annual series of fun programs and outings, many of them with a hands-on outdoor component. They’re led by wildlife biologists, naturalists, historians, and other experts from around the region. If you’d like to watch sharptail grouse dance in April and early May, you can reserve the ground blind that’s positioned right nest to their dancing grounds. It’s free of charge, and a rare opportunity to watch this fascinating courtship ritual. For a modest fee, you can also rent The Bird Sanctuary clubhouse for an event of your own. It’s a popular venue for summertime wedding receptions, birthday parties, and other events. Be sure to make your reservation well ahead of time. Early settlers didn’t think much of these places. They called them “barrens.” Over the years, as newcomers plowed fields, planted trees, and suppressed fires, these open areas gradually disappeared. These grasslands—and the wildlife they support—once covered over a third of Wisconsin. Today fewer than 40,000 acres remain, and 4,000 of those acres are right here in the Bird Sanctuary. Many species depend on this unique ecosystem, and much of what little remains is in isolated pockets too small to maintain the genetic diversity that’s necessary for species’ long-term survival. Northern Wisconsin has only a few remaining contiguous pieces of grassland savanna that are as large as the one preserved here. The Bird Sanctuary also happens to be a great great habitat for humans to explore. For directions to the Bird Sanctuary, click here. ← Right NOW is a great time to sell your lake home or cabin.